Virtual reality is in its infancy, but it’s continuing to take giant steps in the worldwide gaming industry. LOS ANGELES — When Elizabeth Ching took off her headset, she was panting. She had just finished playing a new virtual-reality boxing game called “Creed: Rise to Glory” at E3, the nation’s biggest video-game convention, and she’d knocked her computer opponent out cold. With the exception of a few boxing classes she’d taken, this was the closest Ching had come to fighting in a boxing match. 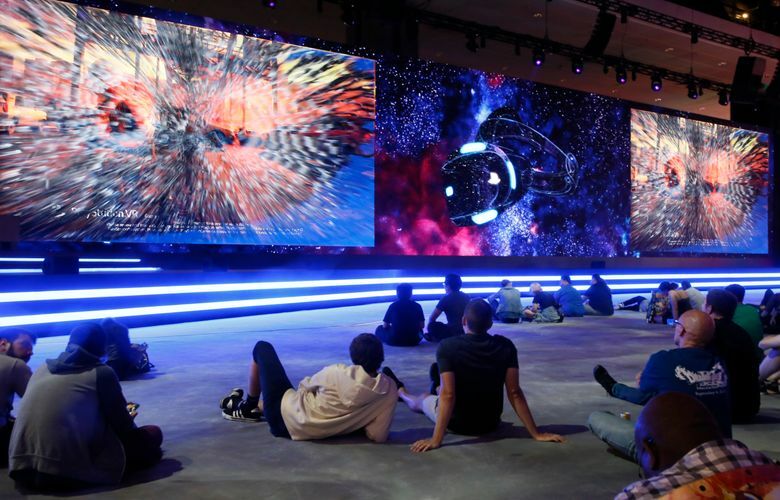 Beyond the new game announcements and software improvements, if there was anything that this year’s Electronic Entertainment Expo confirmed, it’s that virtual reality in the $116 billion worldwide gaming industry is here to stay. The platform is in its infancy — it’s been available for sale to the masses only for about two years — but it’s continuing to take giant steps. With showings from VR makers such as Facebook’s Oculus and Sony’s PlayStation VR, developers are banking on VR’s growth. Sony alone showcased 14 games for its VR device at last week’s E3 conference in Los Angeles. But developers and analysts acknowledge that VR gaming has a challenge: As developers experiment, their ambitions move faster than the technology. Lewis Ward, a video-game analyst at market intelligence firm IDC, said VR headsets haven’t met sales predictions so far, but as the experience improves, sales will go up. Development is getting faster, Ward said. Incorporating VR into a game affects everything: the way players interact with the game, visuals, storytelling and more. What worked when developing flat-screen games may not always work for VR games, some developers said. Aside from the 360-degree view, playing in virtual reality is an attempt to bring the player as close to the real feeling as possible. Looking around requires actual head movements rather than the flick of a joystick, and in the case of “Blood & Truth” holstering a pistol calls for moving your hand toward your waist rather than simply pressing the X button; reloading a gun makes you reach for your ammo on your chest before placing new rounds in the weapon. Because players are more physically immersed in a game than ever before, these smaller motions represent a fresh opportunity, “Blood & Truth” senior producer James Oates said. “Things like moving and traversing, we can now reinvent for VR,” Oates said. With many VR games designed as a more immersive first-person experience, Hampden said developers have to get creative with storytelling. “One of the main challenges is that we can’t control where you look,” Hampden said. “Imagine if you’re making a film and everyone in the audience had their own camera and can point it wherever they wanted during the film. It’s the same kind of challenge we’ve got, so we’ve got to find ways to draw attention and draw your eye,” he said. 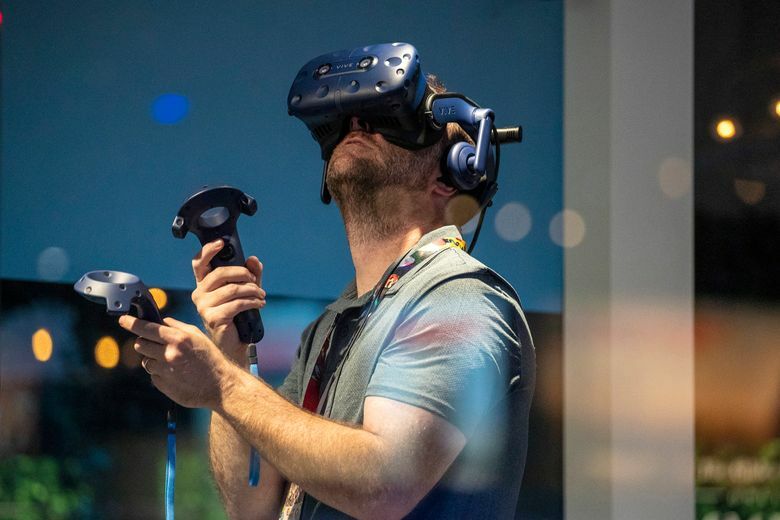 Jason Rubin, vice president of content at Oculus, said that as VR gaming grows, new issues arise both in the technology and in game development. The technology still has pitfalls. For instance, playing VR games for extended periods is nausea-inducing for many users. Fixing that is one of the industry’s top priorities, Rubin said. Developers and analysts concede that VR is far from perfect, but the technology is young and the room for growth is massive.